Return to Nim's Island is based loosely on the second Wendy Orr novel Nim at Sea. 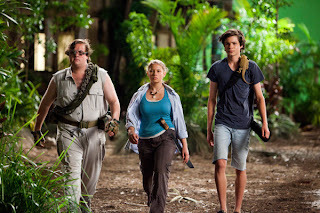 It stars Bindi Irwin in the role previously inhabited by Abigail Breslin and possibly one of the weirdest recasts known to man where Matthew Lillard takes the reigns off of Gerard Butler. The film is easy going enough and sees Nim trying to protect her island from both the Buckaneer Cruise Company who have recently purchased the island to turn it into a resort and from a bunch of lowly poachers intent on stealing some of the islands rare wildlife, including Nim’s best friend Selkie the Seal Lion. The film does centre around an environmental message, but it was not as in your face as might have been expected and tied in quite nicely to the overall plot and character development. Bindi Irwin has clearly found the perfect platform to get her conservation message to a wider audience and at the same time do it in an entertaining way. On the whole Return to Nim’s Island is a light bit of family entertainment with a well meaning message and enough toilet humour to keep the kids entertained during the school holidays.